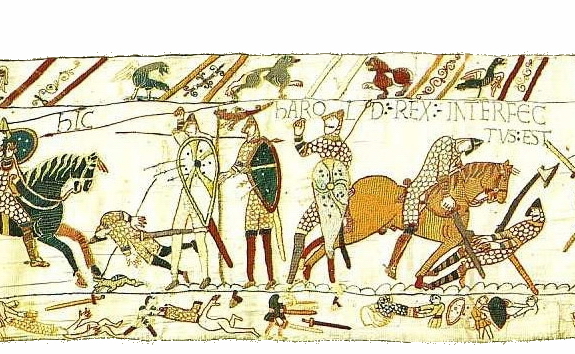 Shield to shield – one or other side closes the short gap and attacks, using spears and swords, protecting themselves and pushing with shields to try and break the enemy line. If neither line broke, both sides would draw back to rest. More missiles would be exchanged then the two lines would close again. This would continue until one line broke through the other, perhaps aided by the death of a leader or capture of a banner. Rout and pursuit – One side would begin to give way. A final stand might be made by some, as at Maldon, but most would flee. The victors would pursue, killing all they could catch. So then did Aethelgar’s child enbolden them all, Godric to battle. 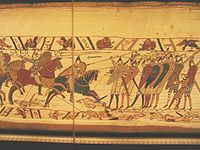 Often he sent forth spears, deadly shaft sped away onto the Vikings thus he on this people went out in front of battle, cutting down and smiting, until he too on the battlefield perished. If a warrior was killed in the ‘no man’s land‘ between shieldwalls, someone from the other side might rush out to retrieve the valuable armour and weapons, such as extra javelins, sword, shield and so on from the corpse. The one best positioned to retrieve the body was often the thrower of the fatal javelin as he had run forward of his shield wall too in order to make his throw. Exposing himself like this, and even more so during his attempt to retrieve the slain’s gear, was a great mark of bravery and could result in much valuable personal gain, not only in terms of his professional career as a retainer, but also in material wealth if the equipment were worth a lot. Due to the very visible and exposed nature of these javelin-throwing duels, we have some detailed descriptions which have survived, such as the following passage. The first part describes thrown javelin duels, and the latter part describes fighting over the corpses’ belongings. Advanced again to fierce battle, weapons raised up, shields to defense, and towards these warriors they stepped. Resolute they approached Earl to the lowest Yeoman: each of them intent on harm for the enemy. Sent then a sea-warrior a spear of southern make that wounded the warrior lord. He thrust then with his shield such that the spear shaft burst, and that spear-head shattered as it sprang in reply. Enraged became that warrior: with anger he stabbed that proud Viking who had given him that wound. Experienced was that warrior; he threw his spear forward through the warrior’s neck, his hand guiding so that he this ravager’s life would fatally pierce. Then he with another stab speedily pierced the ravager so that the chainmail coat broke: this man had a breast wound cut through the linked rings; through his heart stuck a deadly spear. The Earl was the better pleased: laughed then this great man of spirit, thanking the Creator for the day’s work which the Lord had given him. And so then another warrior a spear from the other side flew out of hand, which deeply struck through the noble Aethelred‘s retainer. To him by his side stood a young man not fully grown, a youth on the battlefield, who valiantly pulled out of this warrior the bloody spear, Wulfstan’s child, Wulfmaer the younger; and so with blinding speed came the shaft in reply. The spear penetrated, for that who on the Earth now lay among his people, the one who had sorely pierced. Went then armed a man to this Earl; he desirous of this warrior’s belongings to take off with, booty and rings and an ornamental sword. Then Byrhtnoth drew his sword from its sheath broad and bright of blade, and then struck the man’s coat of mail. But too soon he was prevented by a certain sea-scavenger, and then the Earl’s arm was wounded. Fall then to the ground with his gold-hilted sword: his grip unable to hold the heavy sword, or wield the weapon. Ideally, enough damage would be done to the enemy through the launching of missiles, so that any shield-to-shield fighting would be a mopping-up operation rather than an exhausting and risky push back and forth at close quarters. At close quarters, swords and shields were preferred over thrusting spears. The shield was used to push the opponent in order to create a breach in the shield wall so that the opponent could become exposed to attack. Hacking through shields was a commonly used tactic, so having a strong sword arm and sword were of great benefit. In addition, jumping forward into the enemy with the shield held in front was a common tactic, as was leaping up, resting a foot on the opponent’s shield boss, and striking or stabbing the enemy’s unprotected back with one’s sword. There are numerous references to the horses of warriors in literature and graves with horse burials are known in the early Anglo-Saxon period. By the later period, much of the army may have travelled to war on horseback. There is little evidence of use of horses in battle, except in pursuit of a beaten foe. However, the Aberlemno 2 stone is thought to depict combat between Northumbrian cavalry and a Pictish army and the Repton stone shows a mounted warrior in a fighting pose. Ellis-Davidson, Hilda R. (1962), The Sword in Anglo-Saxon England: Its Archaeology and Literature, Oxford: Clarendon.